Enterprise Performance Management (EPM) is an umbrella term that describes the methodologies, metrics, processes, and technology systems used to monitor and manage an enterprise's business performance. 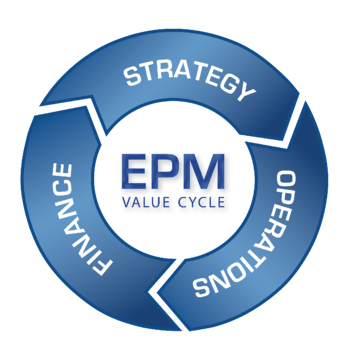 EPM streamlines and improves strategic plans on a variety of critical levels: managing variability, increasing information accuracy and consistency, increasing profitability and shareholder value, lowering overall cost, and other key performance indicators. Planning & Consolidation (BPC): BPC is a single platform for financial and operational process planning, forecasting and reporting. By eliminating the need for separate modules or proprietary applications, we can simplify the technology, data and meta-data management, the cost of ownership, and the user experience. With Microsoft Office and Internet Explorer as the database interface, users have an easy-to-use way to access a single version of the truth—decreasing training time and improving adoption. Business Intelligence (BI): This is a comprehensive suite of applications that provides visualization, reporting and analytics to diverse audiences including C-level, senior management, operational management, power users, analysts and information consumers. Column5 provides technical and application implementation services to help you achieve your business intelligence goals. Strategy Management (SSM): Many strategic programs are derailed by the gap between strategy definition and the processes, technologies, and initiatives required to achieve organizational goals. SSM, in conjunction with Column5's strategic consulting services, enables your organization to bridge the strategy-to-execution gap to make informed decisions that support a unified strategic vision. Profitability & Cost Management (PCM): Column5 uses PCM to help clients generate operational P&Ls that can be leveraged by executives to make critical profit and loss decisions. This platform enables you to identify the customer, product, and business-sustaining activities that comprise profitability-supporting operations, and to link these operational drivers to the financial resources allocated to support them. Interested in creating a roadmap for your EPM strategy or want to improve your existing one? Contact us! Why Replace a Working Spreadsheet Based Forecasting Model with SAP BPC? The Cloud: EPM Bust or Solution?